Revolution 100 double glazing is a stunning dry jointed system which achieves outstanding acoustic ratings, comparable to blockwork partitions. It has its own range of specially designed high acoustic doors. This 100mm wide system easily converts from double to single glazing or vice versa, allowing you to maintain the same visual appearance across a work space, whilst addressing varying acoustic requirements. This versatile system can incorporate a number of extruded aluminium deflection heads. Both inner and outer deflection heads are available, to suit your design intent, and can accommodate up to +/-25mm or +/-40mm deflection. In cases where no deflection is required, a simple 25mm or 50mm extruded aluminium head channel is all that is required. The aluminium base channel can either be 25mm or 50mm deep, depending upon your desired aesthetic. Revolution 100 double glazing can accommodate glass panels up to 1500mm wide, subject to height, configuration, and site logistics. Please contact our Technical Team to discuss the unique requirements of your scheme. The use of dry-glaze gaskets in the Revolution 100 double glazed system makes it quick and easy to install, without compromising on durability, aesthetics or acoustic performance. A number of discreet glass to glass dry joints are available, including clear PETG, flush aluminium, taped, or our virtually invisible patented Nebula™ joint. Alternatively, mullions can be introduced for a fully framed appearance. As with all of our products, the Revolution 100 system is laboratory tested for acoustic performance in a UKAS accredited laboratory, and full test reports are available upon request. Revolution 100 double glazing can achieve Rw45dB using two sheets of 12mm toughened glass and an impressive Rw51dB with two sheets of 12.8mm acoustic laminated glass. The acoustic test is conducted on a full height, multi-module screen with glazing joints and perimeter track-work; not simply a ‘window’ in a smaller sized opening. Testing samples using the latter method will generally give an artificially higher acoustic rating result and any results obtained in this way should be treated with great caution. Revolution 100 double glazing can accommodate glazed and solid door sets from our standard range. It also has its own range of specially designed high acoustic doors. Thanks to huge advances that we’ve made in door sealing technology, our Elite series of glass doors can achieve, as standard, an acoustic performance that is comparable with bespoke acoustic timber door sets. Being glass, they have the added benefit of maximising light transmission. Elite Symmetry and Elite Affinity are 100mm thick pivoting doors offering maximum sound-proofing. They are double rebated with two door frame seals, and additionally feature door edge seals on all four edges. Elite Affinity features a 78mm wide stile which can accommodate a dead lock, sash lock or latch. The Elite Symmetry door features a 30mm standard width stile. A lock isn’t a necessity with this door type, but if a lock is required it can again be a dead lock, sash lock or latch. The maximum door for both Elite Symmetry and Elite Affinity height is 3000mm. In tests, Elite Symmetry has achieved an impressive Rw43dB as a fully operable door set. Elite Affinity takes things to another level, achieving an incredible Rw45dB as a fully operable door set. 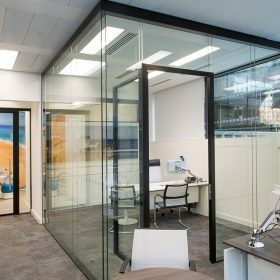 These impressive results mean that timber door sets are no longer the only option when specifying high performing acoustic office partitions. Revolution 100 also has its own pocket sliding door. The Elite Aero door has been tested to achieve Rw39dB. The excellent acoustic performance, aesthetic appeal and adaptability of Revolution 54 make it one of our most popular systems. Optima 217 plus offers a range of double glazing configurations within a single slimline system.